In commodities trading, the energy sector was undoubtedly revived by signs that US employment may be on the mend and that the downside risk of Europe's recession is being addressed. As such, WTI crude prices reversed course and headed higher, managing to gain $3.07 to $94.00. However, job creation remains the Achilles heel in the current environment and many will be hoping that today's US unemployment report doesn't disappoint. Gold prices gained $9.9 to $1,467 yesterday, boosted by signs that global monetary policy could get even looser. This came despite a stronger US currency, which could indicate demand for asset preservation when fiat currencies disappoint market participants. The US Department of Energy released its weekly stockpiles report which showed a much larger-than-expected rise in crude inventories. The figure of 6.7 million barrels was significantly higher than the consensus estimate of 1.2 million, with overall oil supplies also skyrocketing to an incredible 82 year high. As a result, it came as no surprise to see the price of US crude oil plunging $2.12 to $90.92, with extra downside pressure coming from the weak economic data in the US. Gold investors seemingly focused less on the Fed reiterating its current stance and more on the promises of a reduction in monetary policy should the inflation outlook change. This caused the precious metal to resume its slump, with the market losing $18.1 to $1,457.9, after recouping more than half of the now famous two day record nosedive. With US crude oil supplies at record highs, it is little surprise that a triple digit price tag remains elusive, despite ongoing news that the American economy is slowly recovering. As such, expectations that the US Department of Energy will show inventories rising by 1.2 million barrels to another 22 year high pushed the price of WTI crude $1.30 lower to $93.06. Despite anticipation of further monetary easing on both sides of the Atlantic, gold prices ended rather flat yesterday, trading in a tight daily range around the $1,476.5 level. This may imply that the dovish news is already priced in, with investors on standby for more developments before committing further capital. Growth seems to be the name of the game in the eyes of officials on both sides of the Atlantic. Whilst the ECB is predicted to cut rates, the Fed is seen reiterating its current easing stance. The result was heightened optimism in the energy sector and a weakening US dollar, with investors pushing US crude oil prices $1.69 higher to $94.38. With fear of inflation nowhere in sight, it was left to expectations of further monetary stimulus to reignite demand for gold as an alternative asset. As a result, the precious metal managed to climb $10.2 to $1,476.4, with additional support being provided by ongoing news of a pickup in Asian demand for jewellery. The ongoing, and mostly positive, US corporate earnings news did not translate into similarly pleasant reading for GDP growth. As always, the energy sector remained highly sensitive to the overall economy and WTI crude prices retraced $0.30 to $92.90. It's possible that this week's FOMC meeting and the non-farm payrolls figures could rebuild the slightly shaken confidence. Bad news on the economic front put downside pressure on the whole commodities spectrum on Friday, it also pushed inflation fears a little further away. That sent gold $10.1 down to $1456.9 after the metal failed to make a determined attempt to cross above the $1500.00 mark. The WTI crude oil market extended its recent gains for the fourth consecutive session yesterday, adding $1.70 to $93.22 after reports of fewer unemployment claims in the US. Considering the gloomy outlook for the global economy, including renewed questions of whether China is in for a hard landing, energy investors must have welcomed the chance to see crude prices rally. During an eight day struggle, gold has managed to recoup roughly half of mid-April's violent sell off. Yesterday's $37.2 rally to $1,467.8, was the result of rising demand for the physical metal, including bars, coins and jewellery, coupled with ongoing bargain hunting. However, it's probably too early to suggest that we are seeing a shift back to the times when gold was everyone's darling. While the crude oil inventories for last week indicated a lower than projected build, it was actually the crude products which captured investors' attention. In particular, gasoline stocks posted their steepest drop in a year and, given that the US driving season will start in a month, this understandably sparked a sharp rally in US crude prices, climbing $2.03 to $91.58 a barrel. Resuming its upside trend, gold surged $18 to $1,431 yesterday after suffering from the worst sell off for three decades in just two days. Along with heightened expectations that the ECB is considering another set of easing measures, there were also reports of rising physical demand from central banks in Russia and Kazakhstan. Nymex crude oil futures managed to recover from an early slump, closing $0.27 into positive territory at $89.51. Initially, the gloomy outlook on Europe's manufacturing spilled into the energy complex but the US new home sales data saved the day in the afternoon session. Later today, the US Department of Energy is due to report its weekly crude inventories which are expected to show a rise of 1.8 million barrels. We saw a $12.5 drop in gold yesterday to $1,413.1, snapping a five day rally on renewed confidence in the US economic recovery. Meanwhile, the gold market is still feeling downside pressure from expectations of plunging demand for industrial metals after China reported a slowdown in its economic growth. Commodity investors' overall optimism regarding the US economy trumped the slight disappointment in the US housing sector yesterday. 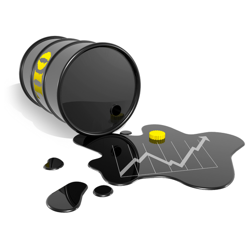 That spilled over into the energy complex and helped push WTI crude oil prices $1.18 up to $89.32. However, the rally was fairly short lived as overnight figures showed Chinese manufacturing seeing a slowdown in growth, sending crude oil into the red. Gold continued its rebound yesterday, with the financial spread betting market gaining $17.7 to $1,426.2, on reports of renewed demand for coins, bars and jewellery. After suffering from such a violent decline, the largest in the last few decades, it was always likely that a few bargain hunters would be enticed back in. This is especially true given that the Japanese have promised QE on a massive scale to get rid of their crippling deflation. After an early rally, which briefly pushed US crude oil above the $89 mark, we saw a slip back into the red on rather quick profit taking. The International Monetary Fund's downgrade of US economic growth expectations from 2% to 1.9% may have been behind the sell off, as well as China's estimated slowdown from 8.2% to 8%. After last Monday's massive plunge, gold buyers made a cautious comeback for the rest of the week. The precious metal managed to cross back above the $1,400 level on Friday and, encouragingly, it remained there posting a $6.2 gain for the day. Nonetheless, it's too early to say whether a renewed slump is on the cards or whether the price is now attractive enough for longer-term investors.